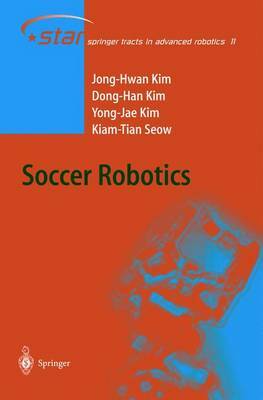 This monograph is a comprehensive introduction to the field of soccer robotics. Soccer robotics has become an important research area integrating mechatronics, computer science and artificial intelligence techniques to create real-world autonomous systems. It also serves as a popular test arena in which to compare the different approaches, in diverse types of competition and with varying levels of distributed perception and collaboration. The focus of this monograph is the FIRA framework of Soccer Robotics, in particular MiroSot, which uses a central overhead camera to overview the whole soccer field and a central control of the robots. "Soccer Robotics" completely describes the different requirements to create a soccer team and details the hardware aspects, the computer vision needed, navigation, action selection, basic skills and game strategy. These aspects are described at an undergraduate level, resulting in a book not only useful as a text for courses but also indispensable for everyone who wants to participate in MiroSot robotics.